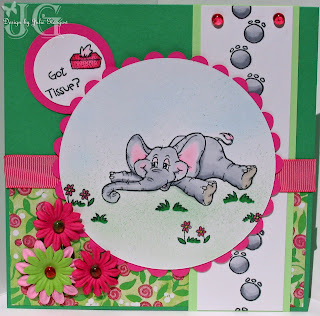 The Blogger's Challenge this week is called Tempting Templates. 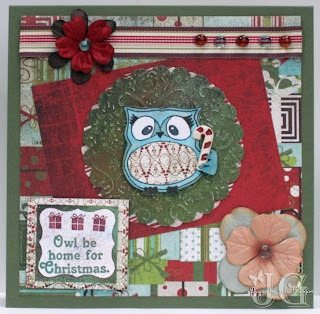 The challenge is to use die cuts or templates. Other notes: The die cuts were the circle scallop and the butterfly. 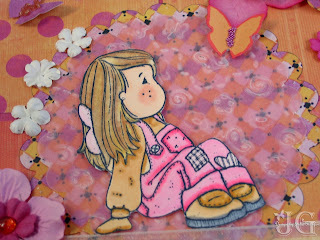 I embossed the butterfly with the Textile Embossing Folder. I also used the Martha Stewart butterfly punch and the oval punch. Next week is our spring break, so I probably won't be posting, but check back on April 6th when I will be starting up again. Thanks for looking. Have a great week! 9 comments that make blogging fun! So sorry I am late with my Christmas card. I actually worked on it last night (the 25th) rather than posting it the 25th. So here is my latest creation. 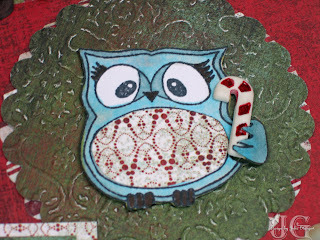 I used a piece of designer paper to embellish the owl's belly. I used Copics to color, but felt the colors were really bright, so I went over my coloring with a light warm gray Copic marker. 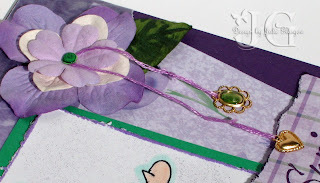 I used the Textile embossing folder to emboss the scallop circle. I think there may have been too much pressure because just the embossing process took some of the color off the paper, leaving the white embossed areas (which I actually liked, so that was kind of cool). I must admit, it feels like maybe something is off in this card. I just could not get the feel I was going for. Is there just too much going on? If you have any thoughts on this, please leave me a comment. I am always trying to learn the little details of good design. Thanks for looking. Have a great Thursday! 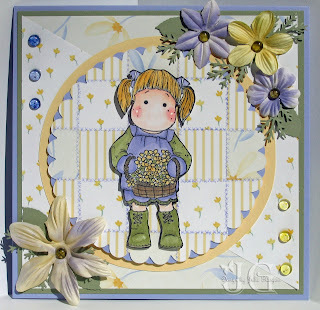 For this card, I used a new Tilda stamp from the Spring Kit. I added the bird to Tilda's hand. The color inspiration came from the flowered designer paper. 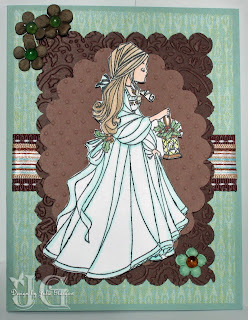 As usual, this is colored with Copics, and have Prima flowers and dew drops as embellishments. I also added a charm to the lower left hand corner as it felt a little blank. I remembered to decorate the inside of my card. Nothing fancy, but just a little extra something. 12 comments that make blogging fun! How perfect is this. The Blogger's Challenge for this week is "Think Spring." I just made this card a couple weeks ago, and had not had an opportunity to post it yet. 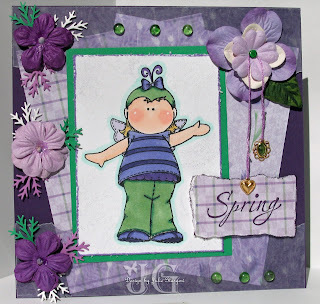 I am so thrilled to have a challenge that works so perfectly for my Spring card. 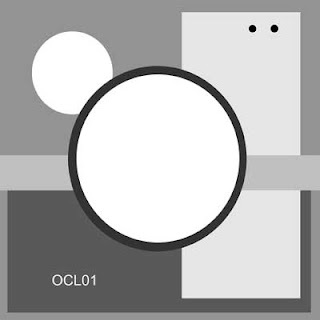 This image is from Hanglars. 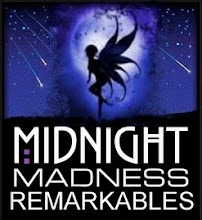 I was fortunate enough for a lovely blogger to stamp some images for me and send them out of the kindness of her heart. I so wish we could buy these stamps in the U.S. I am very happy to at least have some of the images to color and decorate cards with. The colors on this card are my favorites. I love purple and green together. 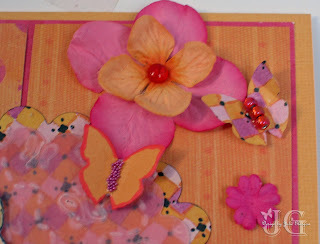 The designer paper is from my stash of Sizzix paper mat stacks. 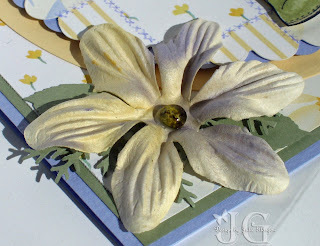 The flowers are Primas and I used The Branch punch to embellish the flowers. I was also able to use some new charms that I got from eBay. One of the charms (the oval) has an indented area in the front. I colored this with my Copics pen and filled it in with Crystal Effects. It looks sort of like an emerald. I love the stamping community and all the wonderfully kind stampers out there who just want to help each other out. To the lovely blogger who sent me the Hanglar images, THANK YOU SO MUCH! To all the rest of the lovely stampers out there, have a great weekend! This is my entry for Roses On Paper Challenge #8, which is to create a quilt card. For my quilt, I used papers from a collection called Joy's Garden from Hot Off The Press. I used a larger version of the same papers for the background behind the circles. I used the Scallop Circle die cut from Stampin' Up! to cut out the quilt and a piece of Almost Amethyst card stock for an added touch. 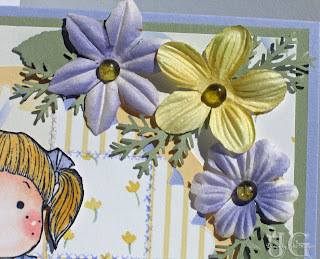 The stamp is from the new Spring Kit from Magnolia Stamps. I absolutely love the new kit. It is full of butterflies, lady bugs and bees, which I adore. The flowers are Prima's from a collection of cream-colored flowers. I used my Copics Air Brush System to add matching colors to the flowers. Now I need a whole bunch more white flowers. I love that technique. I used the branch punch and leaf punch from Martha Stewart, and topped off the flowers with Dew Drops. 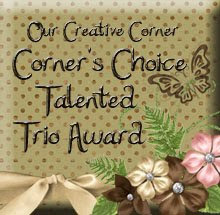 The choice of colors for this challenge came from the March Color Challenge for the Magnolia-licious yahoo group. I am so pleased with the result. All of these challenges are such great inspiration. Have a happy Thursday. The weekend is almost here! ...and here is my card. I used Dr. Peanut for this card. I also used pieces from Lil' Peanut. I used Copics to color. The biggest thing of note (for me anyway) is this was my first opportunity to use my new Copic Airbrush System for the grass and the sky. Wow is that fun to use. The paper is from a Sizzix 4 x 6 stack. I started with the paper and used colors to coordinate. If you have not yet visited, go check out Our Craft Lounge. They have really cute stamp sets! Our Blogger's Challenge for the week is called "It's all about Texture." 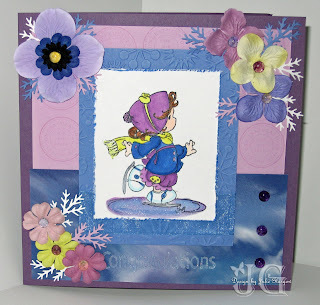 The idea was to use embossing folders or texture plates. Here is my card. 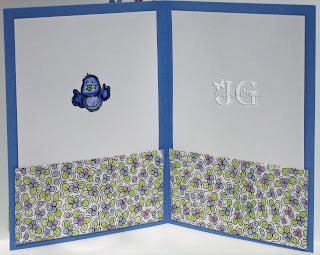 I actually used both a texture plate and an embossing folder (dots) which is hard to see on the photos. The dots are on the background scallop circle DSP, and I used a Fiskars texture plate that has butterflies and flowers on the vellum scallop circle. You can kind of see it on the picture below. This card is just full of texture beyond the embossing. There are flowers, beads, micro beads, dew drops and ribbon. You can see I used the beads and micro beads to add to the butterflies and give them more oomph. The paper is called Everyday Tango from My Minds Eye. It was a huge 180 piece pack of paper that I got on sale for 1/2 off at Hobby Lobby (I love that store!). The butterflies are from Spellbinders. The flowers are Prima's. I wanted to comment also on a great post by Suzy at papermonkey.org. She posted a wonderful description of how she uses her paper for inspiration. This is very similar to how I come up with my inspiration for a card. I usually pick the stamp and designer paper I want to use first. I then choose my coloring medium and colors (usually Copics I must admit). I choose colors that will coordinate with my designer paper. That becomes my palate for the rest of the project. 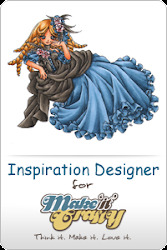 I choose embellishments that will correspond with the feel, theme and color of my project. Go check out Suzy's explanation. She has some great ideas and I could not describe it better myself. You may remember my post a few weeks ago regarding my darling daughter's skating competition. Well, I meant to post this card the next day and got side tracked. I made this special card to congratulate my daughter on completing her first skating competition. We are so very proud of all of her hard work. The skater is from Precious Moments. Unfortunately, they stopped making these stamps many years ago. I did gather a bit of a collection right before they discontinued the stamps. I have been collecting figurines since 1984. I am quite a fan of these darling kids. I love the coolness of the blue and purple together. I colored the image with Copics I used some paper from my stash along with Perfect Plum, Pale Plum, and Brilliant Blue. I ran the blue through by Big Shot with an embossing folder. The Prima Flowers, Branch punches, and Dew Drops finish off the project. It was very fun to surprise our daughter with a little something special to express how proud we are of her. It may have been more exciting for me than for her, but such is the life of a card maker. I love this image from Whiff of Joy Stamps called Lantern Girl and colored her with Copics. While this is really a stamp geared toward Christmas, it was the perfect stamp for a friend of mine. I used Sage Shadow, Chocolate Chip, Close to Cocoa, and some designer paper. 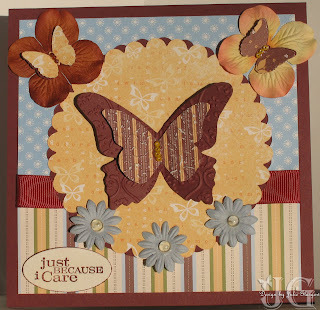 For the brown papers, I used a couple of Cuttlebug embossing folders to add some dimension. I doubled up on the ribbon with stitched chocolate chip and some ribbon I found at Walmart that just happens to be sage and brown. I used some small Prima's and Dew Drops to finish it off.